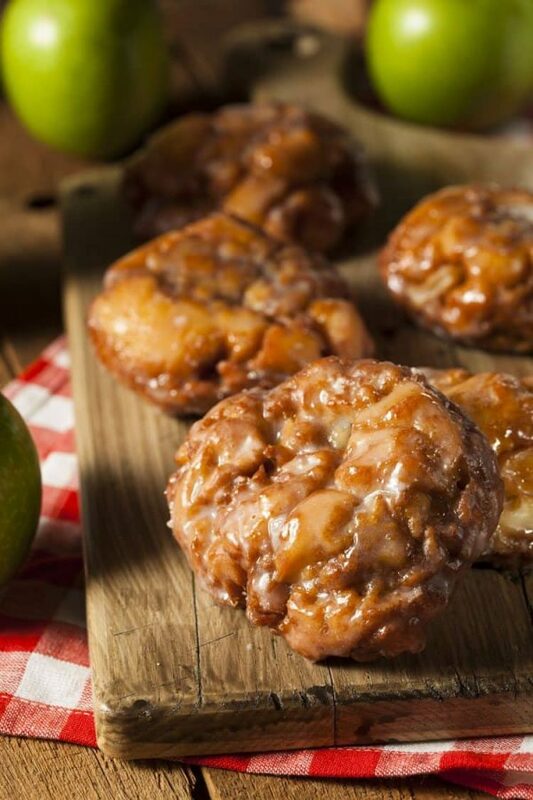 Who doesn’t like a good fried apple fritter? We sure do! That might be surprising considering that we don’t really indulge in a lot of fried foods around here…but there is something to be said for a sweet treat that comes out of the fryer. Give us funnel cake, give us apple fritters… these are a few of our favorite treats–in moderation, of course. Homemade Apple Fritters for the Win! 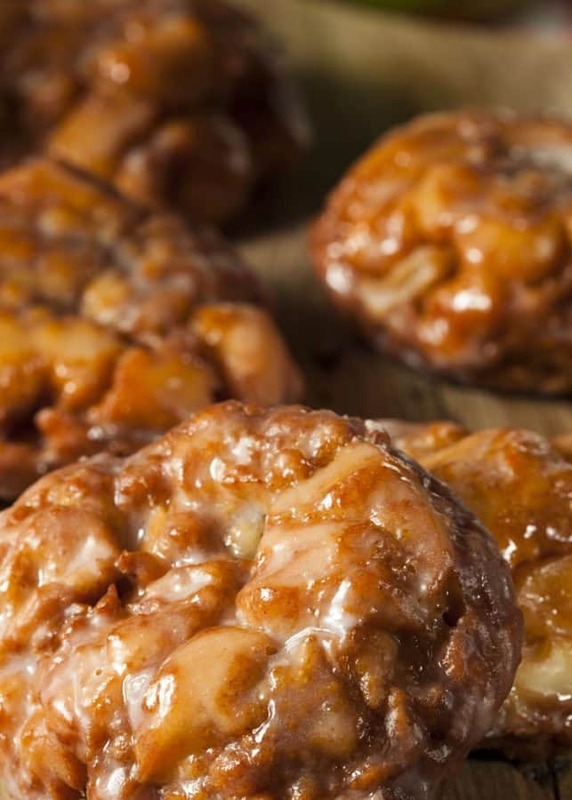 You can make sweet homemade apple fritters for breakfast or dessert. Either way, you’ve got yourself a winner. Like apple recipes? So do we! In fact, that’s why we have an insane number of apple recipes right here on All She Cooks. We have apple pie, mini pies, apple caramel cheesecake, and even homemade applesauce. We eat so many sliced apples in our household that at a recent doctor appointment, the doctor even make a joke that my daughter shouldn’t be needing to see a doctor because she is eating way more than an apple a day. Ah, if only that old adage were completely true! 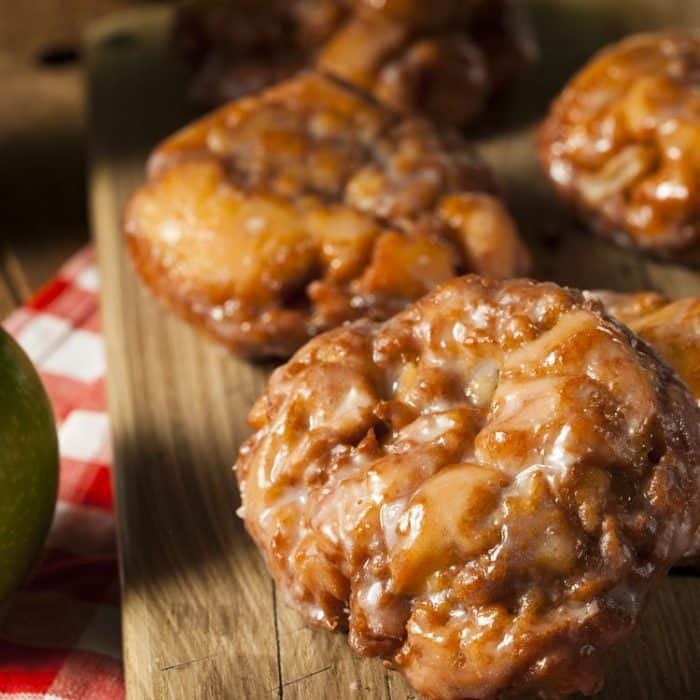 Make these delicious apple fritters any time of year, but they are especially nice as a sweet treat on special days. Think birthdays, Valentine’s day, or any other day that you want to show that special someone just how much you care. Place the 2 cups of canola oil into a deep fryer or heavy pan and allow to heat to 365 degrees. Pour the milk into a bowl with the slightly beaten egg and whisk to combine. Add the apples to the mixture and gently stir to incorporate. In a separate mixing bowl toss together the flour, 1 tablespoon sugar, the baking powder, 1/4 teaspoon cinnamon and the salt. Add the flour mixture to the egg and milk and blend until all the dry ingredients are just moistened. Drop 3 to 4 teaspoonfuls of the batter into the hot oil and fry 4 minutes, turning occasionally for even browning. Remove the fritters when they are a golden brown with a slotted spoon and place on a paper towel to drain. Continue deep frying in this manner being sure to allow the oil to return to the correct temperature before adding a new batch. Place the remaining sugar and 3/4 t of the cinnamon into a sealable plastic bag. Add the fritters a couple at time. Seal the bag after each addition and shake to cover the fritters well. Place the fritters on plates. Place the syrup into a microwave safe bowl. Stir in the remaining cinnamon until well combined. Microwave on high for 30 seconds or until the syrup is warmed. Pour the syrup over the fritters just before serving. How did you make the glaze for the apple fritters? I made these following the recipe to the letter and they were crispy when they came out of the fryer but turned soggy soon afterward. What did I do wrong?